Online registration for this event is closed. Registration will be available at The Running Center on Wednesday, August 8 from 4:00-6:30 PM (packet pick-up) and on August 9 from 3:00 - 4:30 PM SHARP! at the Ethnic Village Gazebo located inside the Illinois State Fairgrounds (race site) If you have any questions/ concerns, please contact the race director (Lance Cull) at 217.652.5651. Race Day registration will end @ 4:30 PM... SHARP! The race is open to walkers, speed walkers, and/or power walkers but there is not a separate category for walkers. The only requirement is that you be able to maintain a 17:00 minute pace due to the Parade in order to be scored. The start/finish line will be taken apart starting at 6:05 PM. Walkers will be included in the age group awards. The Illinois State Fair Parade Route has been officially changed. 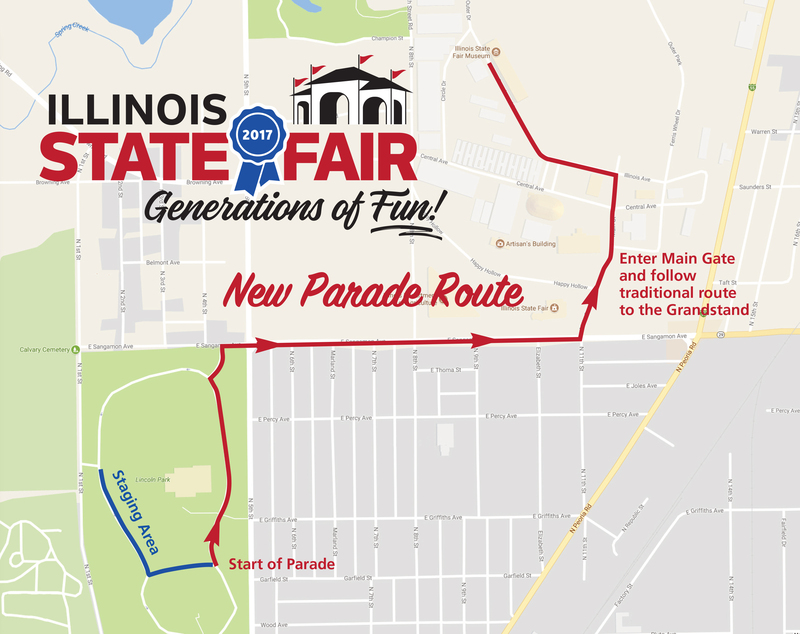 The Illinois State Fair Parade Route has been officially changed. 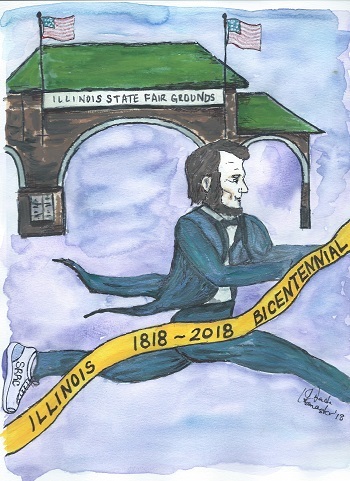 Runners will begin inside the Fairgrounds at Ethnic Village as usual but will travel up Sangamon Avenue and into Lincoln Park. Click here to see the NEW course route! SHIRTS GUARANTEED if registered by July 29, 2018 at 11:59 pm! A pint glass will be available to all registrants. Awards will be given to the top 3 male and female overall, the top 3 in each age division, and the overall male and female in the Master's category. This event will be scored by It's Race Time utilizing disposable chips located on the bib. All runners must wear their bib to be scored. Overall Male & Female winner will be determined by clock time (who crosses the line first). All age group awards will be determined by tag time. Results will be available immediately following the event at www.itsracetime.com. In the event that lightning is present in the area, the race may switch from chip timing to manual timing. The use of personal music devices is strongly discouraged at this race. To enjoy all that our race has to offer and for the safety of all participants, the Illinois State Fair Parade Run encourages a headphone-free environment during the running of the race. Race directors reserve the right to cancel, postpone, or modify the race due to adverse weather or emergency conditions that make race conditions unsafe. In the event the race is cancelled, there will be no refunds. When this page loaded, the official time was 7:55:36 AM EDT.